Why did I buy a Jaguar XJC? I was after a collectible/classic car that I could use on sunny weekends. You know, polish it Saturday and drive it to the country and visit wineries on Sundays. It had to be reliable, a pleasure to drive and attract admiring glances. As I am spoilt by all the modern gadgets found in new cars it also had to have as many creature comforts as possible. I didn't want an old clunker that was collectible but a nightmare to drive. After investigating different makes and models I settled on a Jaguar XJ Coupe for a number of reasons. In my opinion the XJC is a classy modern classic and as very few Coupes were built it's rather scarce and should appreciate in value over the years (yes I know - every owner says that). I had only seen two XJC's on the road over the years and English friends said they were even rare in England. It came standard with climate control, electric windows, power assisted rack & pinion steering, leather interior, central locking, four wheel disk brakes, independent suspension etc., and it was a Jaguar, a brand I had admired since I was a kid. 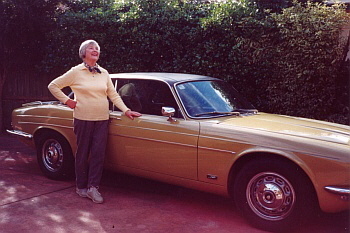 I finally located my 1977 Jaguar XJC in the Melbourne suburb of Brighton and purchased it from a 70 year old grandmother who was finding it too big to drive. She really didn’t want to part with it and became emotional when it came time for delivery and went into her house rather than watch me drive it away. It was part of her 86 year old husbands Estate (he died six months before) and he had owned it for eighteen years. He was the second owner and it came with the original owners handbook and service book showing regular services for all of its 100 ,000 km (60,000 miles) and it had been garaged all its life. This was a fairy tale find and too good to pass up. 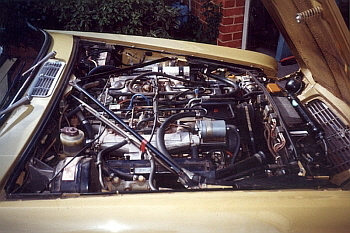 It had been delivered by Bryson Motors in Melbourne, still had the original registration and was one of only 96 XJC V12's delivered new to Australia. Only 39 of the originally imported XJC 5.3's are known to still exist in Australia and the Greensand colour was the fourth most popular colour (21 imported). My car appears to be the only Coupe imported in the Greensand exterior and Olive interior combination. It was in very good, original condition and had only a couple of spots of minor rust and a few minor scrapes on the body. The paint work was mainly factory original and in good condition and the interior was clean and neat with no damage to the leather trim. The roof lining needed replacing and the climate control was not working but otherwise it was ready to use. So the deal was done and I drove home in my shiny old Jag with a grin from ear to ear. It wasn’t perfect but provided an excellent solid car that could be turned into a top example with minimum restoration – or so I believed. What actually happened in the next few months was that I became very fussy and enthusiasm got the better of me and I ended up with a major restoration – and that’s covered in the restoration pages. When I first started to drive the XJC I was pleasantly surprised by how smooth and quiet it was for a 25 year old car. It cruised effortlessly and it needed a constant eye on the speedo to keep it within legal limits. I hadn't wanted a V12, I was actually looking for a six, but the car was just too good to resist. The 5.3 litre V12 with 285 bhp ((212 kw) is very smooth and quiet and as the revs build so does the power. Not the harsh acceleration of a V8, but turbine smooth progressive power. Everything is silent up to 3,500 rpm then you are gently pushed back into the seat and the V12 growl starts and doesn't quit until you hit the 6,500 rpm red line by which time everything is a blur and you are looking for the brakes! Road tests when they were new claimed a top speed of 140 mph (225 kph)! I found it would cruise effortlessly at 100 mph (160 kph) and still accelerate rapidly if you put the pedal to the metal! I wasn't game to test the top speed theory but the way it performs I din't doubt it. And it was as solid as a rock at those speeds. The down side to all of this performance is fuel consumption. It's very heavy on fuel and only gives about 12 to 14 miles per gallon. The best I have achieved on a long highway trip was 16.5 mpg at a steady 110 kph. The XJC has twin fuel tanks with a capacity of over 90 litres between them. When driving quickly it seems that the fuel gauge is moving faster than the clock! Oh well I only drove it on weekends and just had to save all my spare cash for fuel. The more I drove the car the more aware I became of the poor build quality that Jaguar were notorious for under British Leyland in the seventies. They hadn’t paid attention to detail and even though the car was well engineered, very solid and generally well constructed the detail work just wasn't up to standard. During the restoration I paid particular attention to improving panel fit, weather sealing and assembly to improve on the original factory standard. After completing the restoration I drove the XJC nearly 10,000 kilometres, including interstate trips to Sydney (2,000klm) and Canberra. I am pleased to say that the car was very reliable and a pleasure to own and drive. The smooth power and quiet, supple ride make for effortless cruising and it’s very enjoyable to drive on a long trip. Heavy fuel consumption is something you learn to live with and it is more than compensated for by the superb ride and performance of that silky smooth V12.